Game Title: Bomberman Land Touch! It's the grand opening of Bomber Island, an amusement park with tons of attractions! You'll find non-stop excitement as you explore the island, unlock its secrets, and challenge your friends to a variety of games. But, beware of Cap'n Boom and his band of pirates! Hilarius story with all your favorite characters plus new adversaries! Over 30 Touch Screen mini-games to enjoy alone or with friends! Swashbuckling Fun For Up To 8 Players! Up to 4 players via Nintendo Wi-Fi Connection or 8 players via DS Wireless Communications! 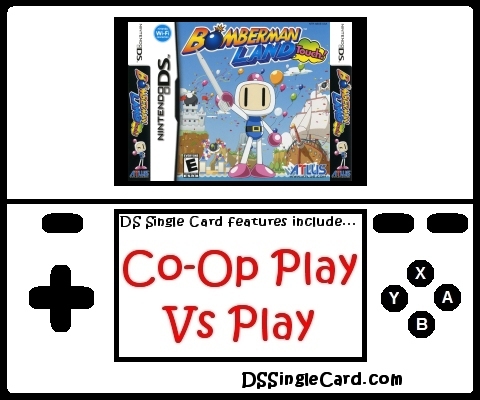 Only 1 Game Card needed for DS Download Play!